J Rae & Cie (La Dorade) | It’s that chocolatey month! 05 Apr It’s that chocolatey month! 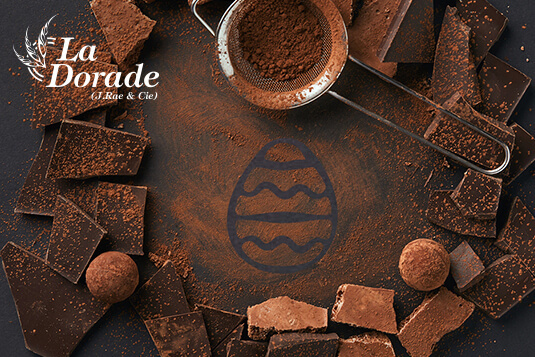 April is the month during which we celebrate Easter and also the time of the year when your customers want to enjoy and indulge in everything chocolate, without the guilt. Crunchy or moist, white, milk or dark, chocolate finds its way in all pastries, which means great joy for all. It is also the opportunity for you, pastry chefs, to prepare your most beautiful gourmet creations, and savour a nice turnover. Here are some ideas that you can easily put into action, with the ready-to-use mixes and the wide selection of chocolates we offer. Easter is fast approaching, bringing all sorts of chocolates and luscious treats. This joyful celebration is the occasion for many families to gather around a feast, complemented by a scrumptious chocolate dessert. Offer them shortbread with chocolate mousse, three-chocolate creams or a tiramisu, that you can prepare in a jiffy with our ready-to-use mixes. And for the real chocoholics, who can resist a chocolate fondant or a molten lava cake? Everyone loves chocolate cakes! Whether they are moist, marble or creamy, they will be the most loved treats of this chocolatey month. Prepare delectable chocolate sponge cakes, rabbit-shaped brownies or bells in just a few minutes. 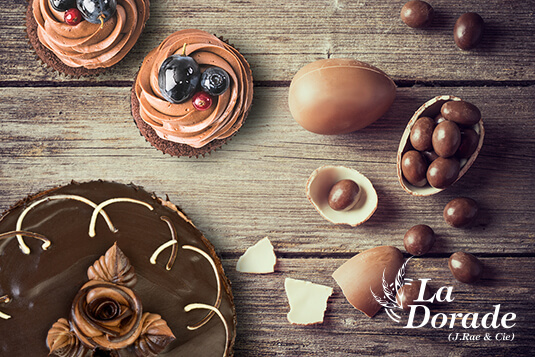 Why don’t you try some cute chocolate cupcakes decorated with Easter eggs or cookies dipped in chocolate? Do not hesitate to add some extra yumminess with chocolate chips or by spreading a few chocolate vermicelli. We have everything you need to make your job easier. The secret of a great topping or chocolate filling is, of course, the quality of the chocolate. We offer a wide selection of superior quality chocolate, creamy and with a rich cocoa taste. In powder, crushed, in disks, in drops or in blocks, our chocolates make toppings and fillings worthy of a Michelin-starred Chef. Make delicious ganaches with our extra dark disks (64%), available in packs of 5 kilos. Our crushed chocolate is available in dark and white. Rich and creamy, it’s all you need to make irresistible eggs, bells and chocolate bunnies that will delight all the little foodies. Get your creativity flowing and make your most beautiful culinary creations. Contact us to place your orders and be ready to make the most of this month dedicated to chocolate!